Another post today. Firstly any tips on how often to post? I know could just google that but I was hoping for some comments on the subject (hint hint). I have read a lot of contradicting information, some people say daily, twice a week, weekly, some say daily is too often etc. So today I went to Dimbola Lodge in Freshwater on the Isle of Wight, which is the home of Julia Margaret Cameron, a women who made a breakthrough in early glass plate photography and who was friends with Darwin, Tennyson and Lewis Carroll. She even had a special gate built in her garden wall so Tennyson could drop by across the field from his house without being bothered by servants and the public. I was especially pleased to see the Annie Leibovitz exhibition: Pilgrimage. A documentary of her travels to visit houses and frequented haunts of famous figures in the history of art, photography and science. The picture that moved me most was of a tunnel of trees in autumn, the ground covered with copper leaves, entitled, ‘The path at Sandlot where Darwin walked every day’. Worth going to see, it only costs £5 entry into the house which includes the exhibit. It is on till the 12th of July this year. Here is a good review (written in 2011) that explains a bit more about her pilgrimage. 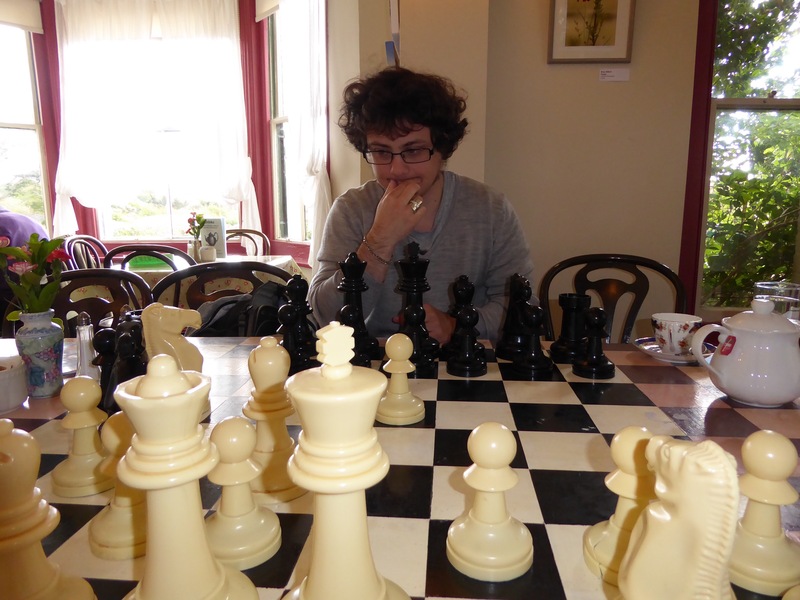 Then we had lunch in the cafe and played giant chess on the table! I won the first game and my Mum won the second. Not bad as I haven’t played properly in years. The cost of marine litter. Yesterday I took a walk down the esplanade at Shanklin, it was hot and sunny. I was having a play with my new camera, which I will review at some point, and I took this snap of some plastic debris on the beach. A huge string of 60,000 plastic bottle tops has been displayed on a beach to highlight the problem of marine litter. Then today I went to Quarr Abbey, which is looking awesome btw after having a new heritage centre and car park built using their lottery fund money, and dropped into their new craft room. A lady there was making some wonderful art using driftwood, scrap metals and plastics found on the beach. I know this is quite common nowadays but she had some great pieces, I wish I could have afforded one. Some of the metal was possibly from crashed airplanes! Check out: www.gillianconnorart.com she paints really cute tiny beach huts into her art too! But there will be no shortage for hundreds of years of waste in the ocean for projects like hers, so please remember this summer, on your holidays, take your litter away with you and don’t drop anything over the side of your boat. I’m sure it’s not you but just remind your friends too. 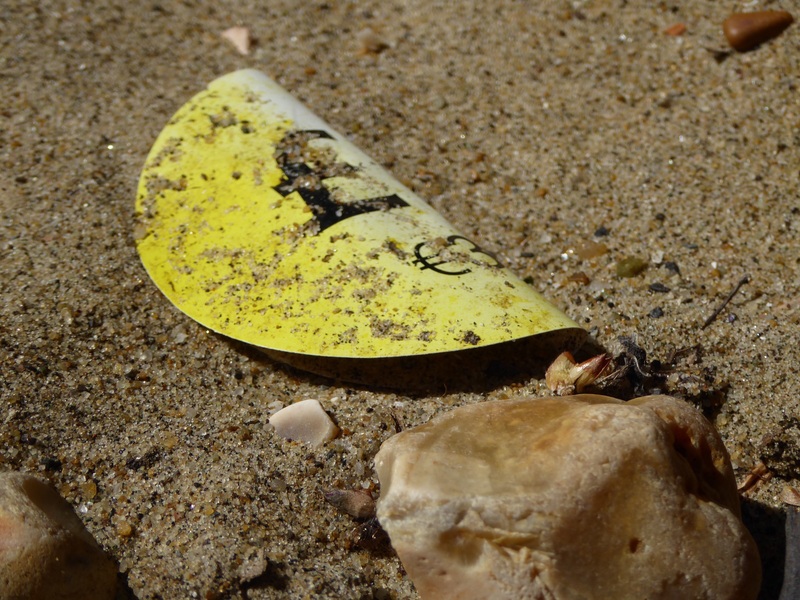 Here is the Wikipedia site for marine debris for some interesting stats. 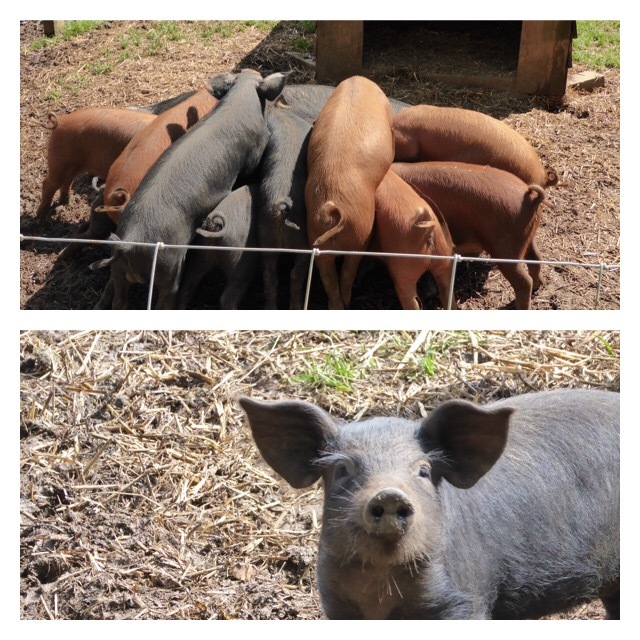 On a more positive side, Quarr Abbey had some super cute piggies. Here is a pic of them fighting over mum and one of the runt of the litter, she was so sweet. Today I went to Gloucester Road to collect my Visa for Thailand. Yesterday I dropped it off for processing and then visited the Natural History Museum. Today I chose to go to the V&A to see the Alexander McQueen exhibition because it is only on until the 2nd of August and I will still be away then. The exhibition is described as the first and largest retrospective of McQueen’s work to be presented in Europe. It was certainly much bigger than I expected and covered his entire career. I especially liked one of the pieces from his final 2010 collection; Plato’s Atlantis, in which the fabric for several pieces has been digitally printed with images of things such as jellyfish and moths wings. It is totally worth going to see and it is free to members so you have absolutely no excuse not to go. There is not really any need to book (I didn’t) because they release tickets for each time slot every day. It was amazing and I even bought the book, but I had a discounted student entry, I might not have done so if I had paid full price. These exhibits are so expensive now! It was amazing though and used multi media to great effect. It was almost as good as the David Bowie exhibit I saw last year. But I won’t tell you any more in case you plan to see it. What I’ve planned for the first 10 days of my trip to Thailand. So my flights are booked and I fly out on the 4th of June. I am flying with Emirates Airline with a changeover in Dubai on the way to Bangkok, arriving on the 5th of June. That’s a whooping 16 hours traveling! So I mentioned that I had booked a trip with Geckos in order to induct myself into the country, I have now received the itinery for this trip and I have detailed the basics of it below. I am arriving two days early and staying in the same hotel as the group will meet on the 7th of June. The trip is called ‘Tales of Thailand’ and is seven days long. It starts in Bangkok at thee Nouvo City Hotel (Canal wing) which I will have spent the last two nights. For what I can gather from the person on the phone, there are about eight of us booked on the trip. Now I am not one for packing a bunch of stuff in just for the sake of it but I will be doing everything on this trip as the rest of my time in Thailand is completely unplanned so I will have plenty of time to ‘see where the winds takes me’ as they say. -Travel to Sukhothai – ‘The Dawn of Happiness’ by local bus approx 6 hour. -Ride bicycles around the temples and other archaeological relics in Sukhothai’s historic area. -Friends of the Asian Elephant Hospital in Lampang. Friends of the Asian Elephant Hospital is a non-government organisation in Thailand which aims to protect and conserve the welfare of elephants both domesticated and wild. We stop off at this center today to see the fantastic work this organisation is doing to care for the elephants in Thailand. -Visit some of tthe temples in the northern city of Chiang Mai, with over 120 temples in the centre alone. -Tea in a traditional Chinese tea house overlooking the mountains. -Visit the interesting markets, full of produce and crafts made by hilltribe people. -Climb the 719 steps to see a budhist temple with a great view. -Travel on local songthaews, to visit the point of the Golden Triangle where the Thailand, Burma and Laos borders meet. -Visit to the House of Opium Museum for a deeper insight into this area’s problematic past. -Visit the famous white Temple in Chiang Rai Wat Rong Khun to see the best quirky temple you have ever seen. -Bus back to Chiang Mai (approx 3.5 hours). -Back in Chiang Mai board an overnight train for Bangkok (approx 13 hrs). Sounds exciting! 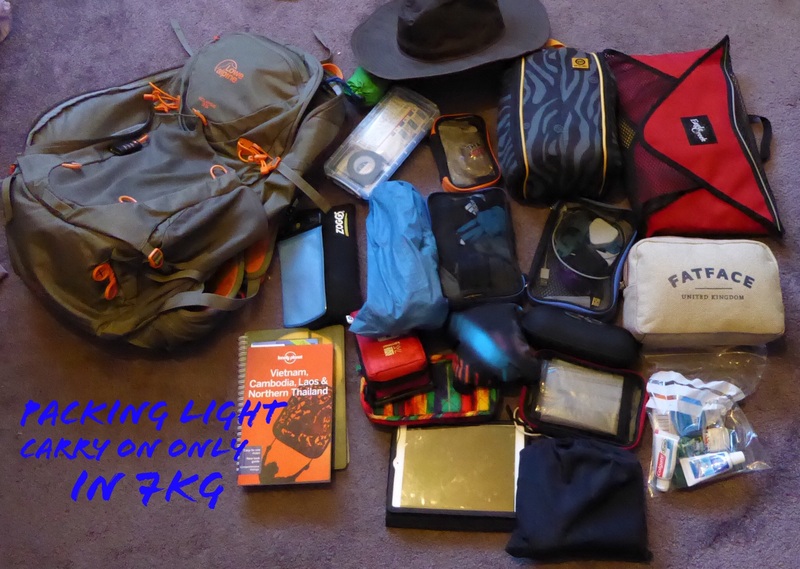 Now I did I say I would post my packing guide for packing light, and I will….. Tomorrow off to the Thai Embassy to get my Visa! So my flights are finally booked for the 4th of June, and with a flexible return flight as I don’t know how many months I will want to spend out there? I have also booked a trip with Geckos Adventures, called ‘Tales of Thailand’, which is seven days. I decided to do this as I have never been to Asia and I thought it would be a good way to induct myself into the country. You can check out their trips @ http://www.geckosadventures.com they are small group trips aimed at 18-39 backpackers. Hello my name is Jeffrey Salkilld and I run William Stone Upcycled goods. I will be traveling abroad this summer and I thought this would be a great way to keep you all up to date with where I will be. This blog will mainly be about William Stone, our lastest products and ideas and tips on upcycling from us. I have pulled together all our sites, like Pinterest and Instgram so you can keep up to date with all of those in one fell swoop.